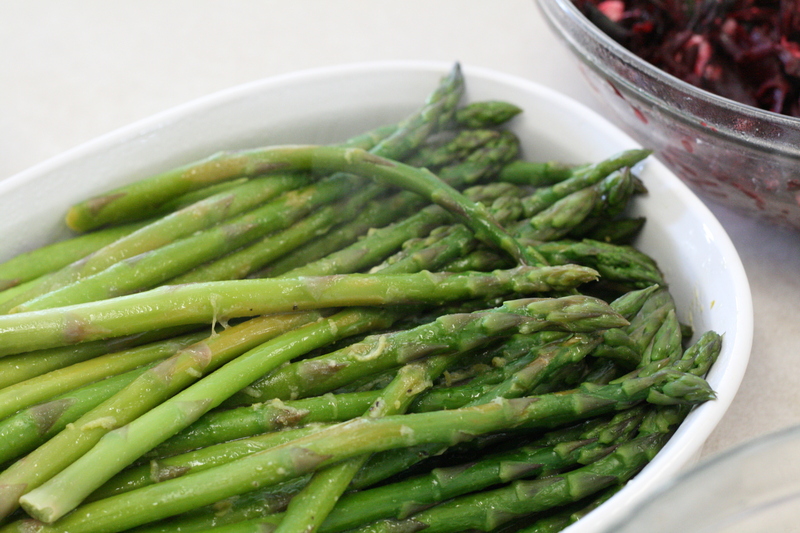 Now that spring is here we can look forward to one of the very first fruits from the garden: asparagus! 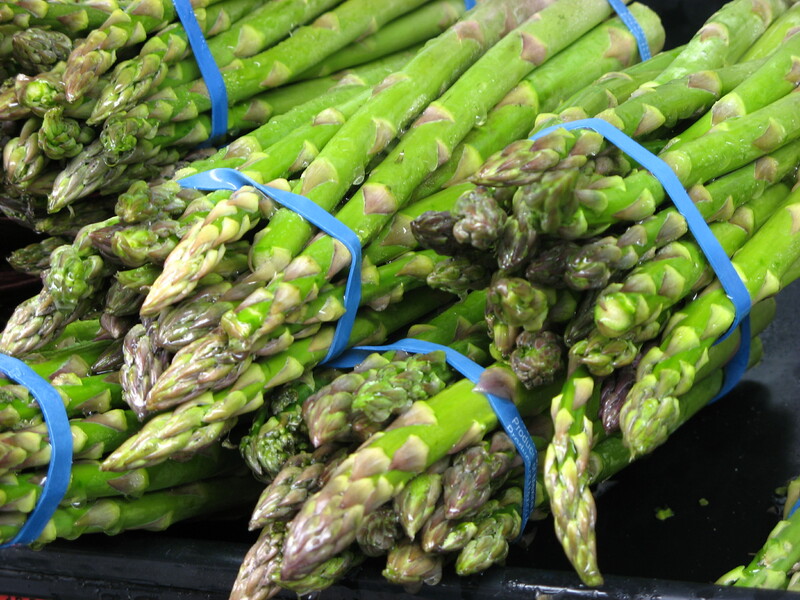 Asparagus ranks very high on my list of favorite vegetables and each spring I buy as much as we can possibly eat, desperate to enjoy this delicacy while it lasts. I believe it is thanks to my grandmother and my aunts and uncles and parents that I actually like asparagus. As a child, I watched as my grandmother picked the tender asparagus shoots from her garden and the adult relatives raved over the incredible taste as they dipped the steamed stems in butter and popped them in their mouths. Positive peer pressure took effect and I decided I should learn to eat this vegetable. 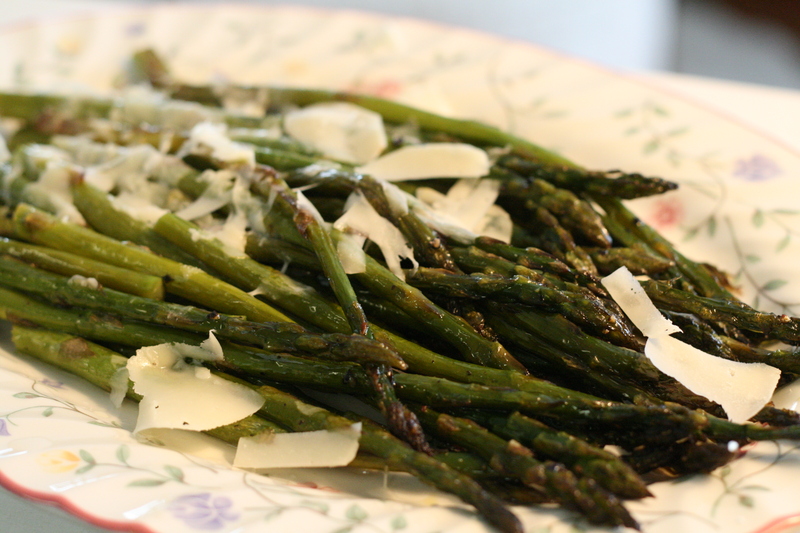 Fortunately, my husband enjoys asparagus as much as I do and between us we can eat an entire bunch at one meal. I'm an all out fan of the fat stalks versus the thin ones. The silky, custard-like centers of the fat spears have won me over. Steam the asparagus. Meanwhile, smash up the mint in a pestle and mortar until you have a pulp, and gently melt the butter with some salt and pepper in a frying pan. Add the mint pulp and the juice of one lemon. Stir together and when it's slowly bubbling, remove from the heat. Pour the mint and lemon butter over the steamed asparagus and garnish with a few mint leaves. NOTE: Jamie suggested using white asparagus for this dish. I didn't have any available so used green. 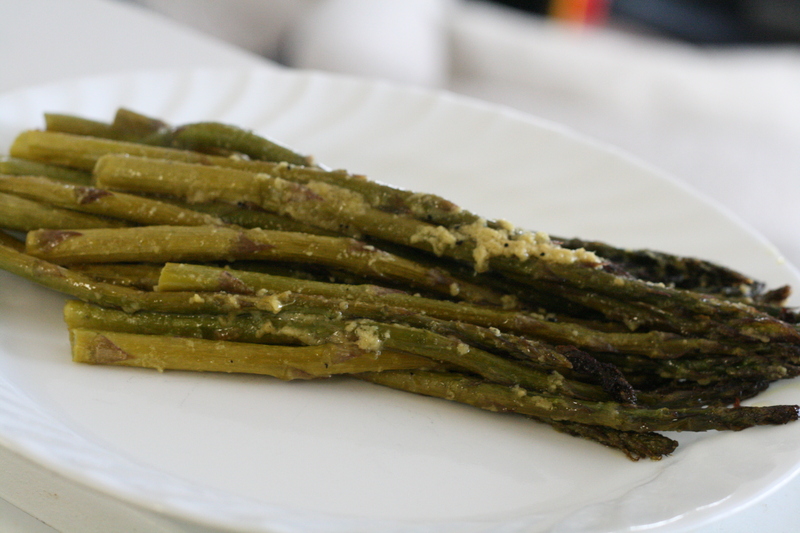 If you have never tried roasted asparagus, please do! It's such a delightful, and different, way to enjoy this vegetable. The trick is the right length of time -- you want the asparagus to cook through and gently brown but you don't want to overcook it. Just keep an eye on it and use the freshest possible spears. Preheat the oven to 400F. 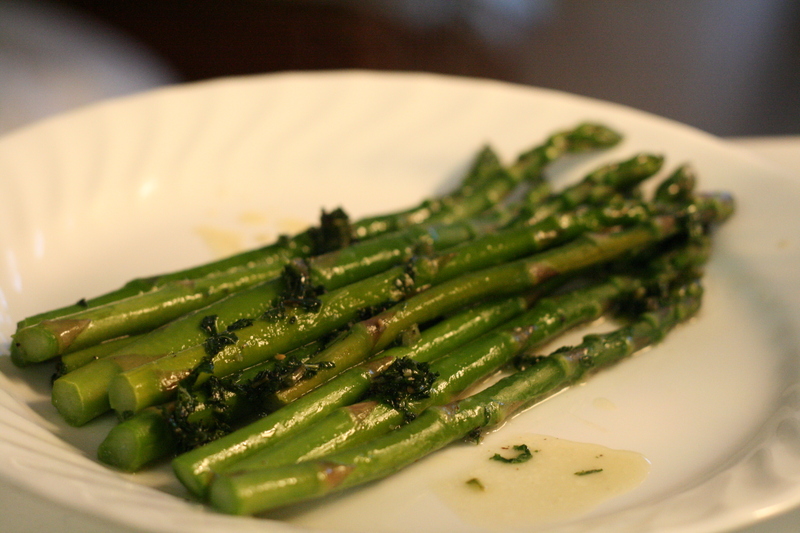 Drizzle the asparagus with olive oil and sprinkle with salt and pepper. Bake for about 15 minutes or until desired doneness is reached. Place on a plate and drizzle over the lemon juice and sprinkle with shavings of Parmesan cheese. NOTE: Jamie originally suggested grilling asparagus in a grill pan. If you want to try this, heat a large griddle pan and dry-grill the asparagus spears on both sides until nicely marked. Once cooked, dress with lemon juice, olive oil, salt & pepper, and Parmesan cheese. Steam the asparagus. Meanwhile, whisk up the mustard, olive oil and vinegar in a small bowl. Add the white wine or water if you feel it needs to be thinner. Season with salt and pepper. If you are using lemon zest, add this to the vinaigrette. Poor the vinaigrette over the steamed asparagus and sprinkle with freshly chopped herbs. This recipe was by far my favorite. Alaina and I ate a bunch of this one day for lunch and neither one of us could stop eating it until it was gone. Unfortunately, the asparagus I had was not very fresh, and that is why it turned yellow upon roasting. Imagine how delightful it would be with the freshest spears! Preheat oven to 400F. Spread cleaned and trimmed asparagus on a baking sheet. Mix together remaining ingredients and pour over asparagus. Mix to coat spears well. Bake for 15 minutes or until desired tenderness and crispiness is reached. Thanks for posting these, Heather. I saw asparagus at the grocery but it looked intimidating and for a fancy meal. These recipes are inspiring! i absolutely love asparagus! i always look forward to it being in season and it makes an appearance at our table just about every time it's on sale. :) thankfully luke likes it too. :) these recipes look great!